With her latest exhibition at June Kelly, Su-Li Hung continues to pursue an idiom of painterly representation that is often abstracted and always richly colorful. But the series of triptychs that form the core of this exhibition, with their juxtapositions of images of Buddhas, spreading tree canopies and stylized rivers, suggests to me another, less familiar side of the artist. As it happens, over the decades Hung has published 31 books of poetry and essays in Hong Kong and her native Taiwan. Is her written poetry having more influence on her painting? Possibly; in any event, the sequences of images in her latest triptychs suggest a kind of lyrical narration, one inspired by the yearning for transcendent connections. What the visual poetry of these paintings might mean, I can’t say for sure. But they speak convincingly of an ardor for the beauty of nature, and for a spiritual closeness to it. Moreover they are energized by a painter’s eye, and persuade through a painter’s means – that is, through adept colors, weighted to re-create light and space, and drawing that coheres these elements into tangible forms. 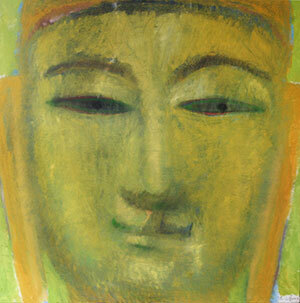 In “Golden Buddha” (2014), one of several single canvases in the show, yellows ranging from greenish ochre to bright yellowy-orange robustly shape the volumes of a broad face. Tiny notes of red and blue—an eyelid, or shadow at the ear—spell out its breadth. The ponderous face perfectly supports the even-handed, inwardly-looking gaze of the half-shut eyes. By contrast, “Green Summer Tree” (2012), another single canvas, seems inspired by sensations of growth. Upon a background of small, prismatic green fragments, a dark tree trunk winds across and bisects the canvas; emerging from it, smaller branches divide and redivide the space, finally melting into the tapestry of facets. The triptychs combine the Buddhas and trees with a third motif: stylized impressions of rivers, most of them represented by verticals of layered, short horizontal strokes that suggest shimmering reflections. Each triptych consequently unites the mild expressions of Buddhas with images of tangled growth and glinting water. In “Dancing Cherry Tree, Buddha, Pink River” (2002-2014), the chiseled forms of a statue-like Buddha contrast especially dramatically with the expressionistic, almost fleshy pinks of tree and water on either side; the tree quivers, as if it were only a reflection, while the river—uniquely in the show—seethes as a crisscrossing mat of lines, woven like coarse fabric. What story connects the stoic Buddha to elements that seemingly shift from liquid to solid and back? It’s hard to say, but the image convinces, and we want to linger before its strange poetry.